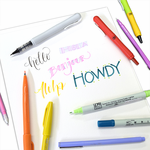 The increasingly popular Posca paint markers are here in all shapes, sizes, colors, and exclusive multicolor sets! These markers contain opaque water-based paint for marking on almost anything- metal, wood, glass, plastic, plaster, canvas and more. Will bond permanently to wood, clay pots, posterboard, plaster and other porous materials. Marks on non-porous/sealed surfaces are waterproof but can be removed with an ammonia-based cleaner. Popular with surfboard designers and rock painters. Widely used for customizing things like shoes, headphones, etc. Excellent for chalkboard signs- even those exposed to the weather. Great for temporarily marking up glass windows. Used extensively by auto dealers to mark windows with advertisements. Acrylic-type paint is non-toxic, acid-free, odorless, lightfast, and Xylene-free. 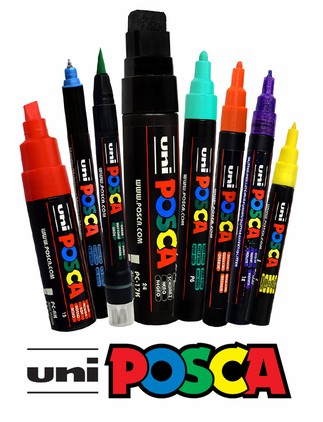 Posca replacement tips can be found here! Organize & store your Posca markers with our exclusive Marker Case available here! Now available in the U.S.- the Posca PC-7M Broad Bullet Tip markers!! New colors now available in the PC-17K, PC-8K, PC-5M, PC-3M, PC-3ML and PC-1M!